undefined/ed-says-article-709-tyqu9eib-Family Time: The BFG or Pete's Dragon? 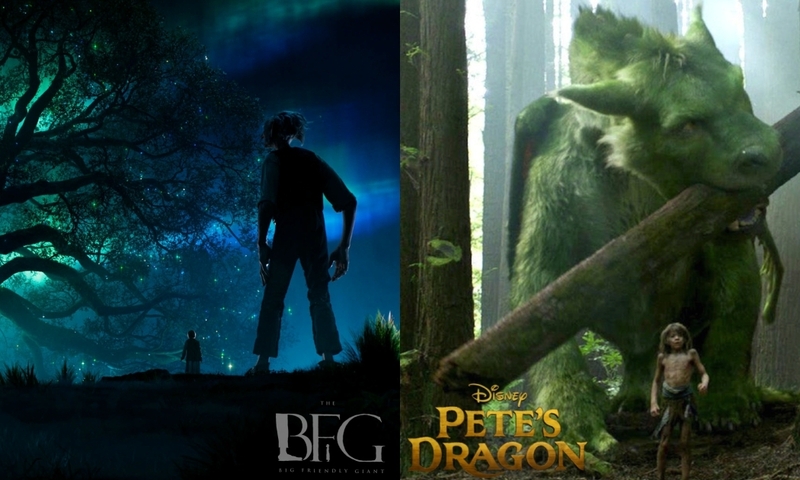 While you can’t go wrong with either BFG or Pete's Dragon for this weekend’s family fun time, different movies are for different moods. So here is a comparison of these two wonderfully made Disney movies for you to choose the one that’s perfect for your feel-good family bonding time. Proper British English peppered with Roald Dahl’s endearing Giant vocabulary, such as “Hippodumplings” and “telly telly bumkins”, along with Roald Dahl’s wonderfully imaginative drinks like “Frobscottle” for English breakfast. The language is typical of all American Disney movies that we are familiar with. This is a remake of the 1977 Disney film. This new version helps young audiences understand the same cultural references that their parents grew up with, while giving it a facelift and tone that connects with this newer generation. Steven Spielberg reunites with the screenwriter of E.T. to bring life to this beloved classic. Expect the CGI effects with motion-capture techniques to draw you into this wonderful, magical Giant Country, where BFG gently lives his life and tends to his guardian. Dragon Elliot may look like the only fantastical special effect in this movie, but the visuals are stunning because of the backdrop. Elliot lives in lush forests with marvellous creatures and rivers running through magnificent mountains. Pete and Elliot soaring through the skies and valleys in a Game of Thrones-like style is also a real treat to see! Steven Spielberg plus Roald Dahl equals a bold horror concoction that stimulates any child’s imagination. There are dark allusions to previous friends of the BFG eaten by bad giants, and violent names like “Fleshlumpeater” and “Bloodbottler”, typical of Roald Dahl books. Peter's dragon, Elliot, is a humongous winged creature with a furry, cuddly face and gentle affection for our blonde-haired protagonist. We want this beast to win. It is the bad humans, destroying the beautiful forest and threatening the freedom of wild creatures and hurting Elliot, who are scary – as in real life. The difference between feisty Sophie and soft-hearted, grandfatherly BFG is stark, but they embrace each other through complementing each other’s virtues. This is a story about how the purest friendships can help us break through in our lives and believe in our dreams. Through the sincere sharing of Robert Redford’s character, Mr. Meacham, we understand the importance of respect in the presence of nature, that people should resist the desire to hunt, and simply admire the power and beauty that the wild has to offer. Pete and Elliot’s friendship symbolises how humans can be blessed by nature, if only we would love and protect it. It is also a film about friendship and believing in what the heart knows to be true, and remaining untouched by the scepticism of adults. Child actress Ruby Barnhill does an excellent job as precocious Sophie. Her chemistry with Mark Rylance’s BFG makes the kindred spirit between the giant and child completely believable. Mark Rylance’s expressive features also lend credence to the kind friendliness that is quintessential BFG. Child actor Oakes Fegley is as soulful as his on-screen best friend, Elliot. The love, care and heartbreak of his performance make us believe in his dragon. Adult actors Bryce Dallas Howard, Robert Redford and Karl Urban also sync their performances perfectly and without complication to tell this story to a young audience, while transporting big kids like me back to a more innocent, nostalgic time. Now, it’s time to venture into one of these worlds to find out more about the BFG and Sophie, or Pete and Elliot the dragon!